Do you know how dangerous it is to have freshly baked granola sitting on the counter during a long winter evening? And by dangerous, I mean it totally feels healthy enough (vegan, oil-free, buckwheat!) to keep picking away at all night long. You can be sure we did. Each time one of us left the kitchen with a couple clusters in hand, we’d say, “OK, this is the last piece of the night!” only to be tempted back into the kitchen during the next commercial break. This granola stands apart from the crowd with its lightly sweet, oil-free clusters of crunchy cinnamon-coated buckwheat and sunflower seeds. There isn’t an oat in sight, but we hardly noticed or even cared. For those of you who were pleading for a recipe using almond pulp, you’ll be happy to know that I threw my leftover almond pulp into this batch and it blended seamlessly. I’m sure it also works just fine without it though. Added on top of a Green Monster for breakfast, I couldn’t take those pictures fast enough! Snap, snap, slurp, slurp. Vegan, Gluten-free, Oil-free. For nut-free version leave out the almond pulp. 1. Preheat oven to 300F and line a large baking sheet with parchment paper. 2. In a large bowl, mix together the dry ingredients. 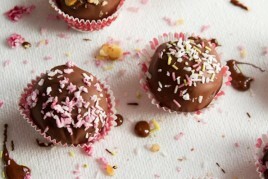 If using almond pulp, it will remain a bit chunky, but not to worry. 3. In a smaller bowl, mix the wet ingredients until combined. Add wet mixture to dry ingredients and stir until the dry ingredients are thoroughly coated and wet. 4. 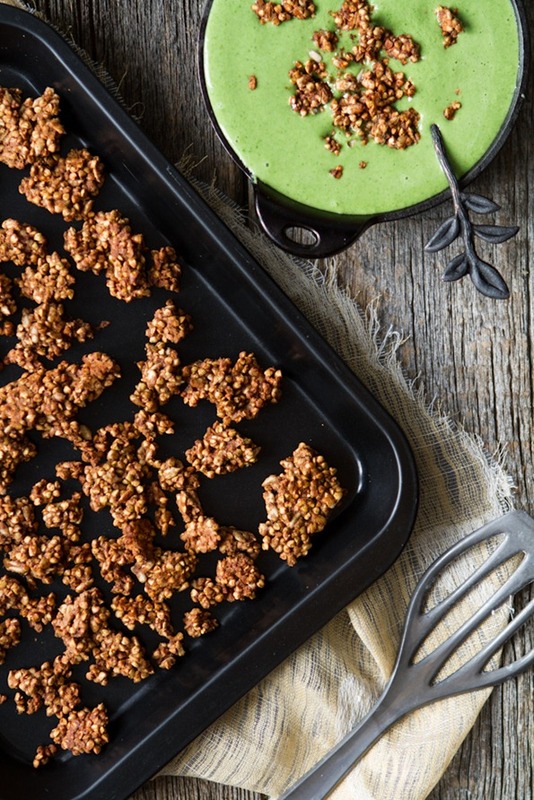 Spread granola onto baking sheet in a uniform layer. Bake at 300F for 20 minutes, roughly flip granola, and bake for another 18-20 minutes, watching closely so it doesn’t burn. Granola will be lightly golden on the bottom and will harden a lot during the cooling process. 5. Cool completely on the pan and then store in a glass container on the counter for up to 3-4 weeks (just an estimate). Notes: 1) I assume this recipe also works without the almond pulp, so if you don’t have any still give it a shot. 2) If you don’t have coconut nectar, feel free to use brown rice syrup. Honey would work too if that’s part of your diet. These sticky sweeteners help the granola clump together. You can also use maple syrup or agave, but I don’t think the clusters would hold together as much. PS- If you are looking for an oil-free oat-based granola, check out my Lightened Up Summer Granola. It’s probably the most popular granola recipe on the site. Hi Jill, I didn’t soak it, but I will have to try that sometime. I also wasn’t sure if the wetness from soaking would impact the overall result or not? I know some people soak buckwheat and then dehydrate the kernels until dry before using, so that is an option. If I try a version with soaked buckwheat (without drying it before baking) I will be sure to update my results in the recipe! Good to know! The only time I’ve cooked with/eaten buckwheat was in your Raw Breakfast Porridge, so I just wasn’t sure if soaking was for all buckwheat dishes or just raw. Thanks! Hm, I am pretty sure that soaking would have an impact on the recipe. Buckwheat gets pretty soaky… maybe it wouldn’t stick together anymore. I’m so behind on posts, but I make granola with sprouted buckwheat (soak for ~8 hours, then drain and sprout for 3 days, or until sprouts are 3-4mm long). It doesn’t affect the overall result at all (if anything, you just need less wet ingredients). I’ve also found that pumpkin puree is an awesome addition to the wet ingredients! Ladies, I soaked my buckwheats before didn’t impact the final result. I did drain quite well and then had them sitting in a glass jar in my fridge for a few days before making (not intentionally). 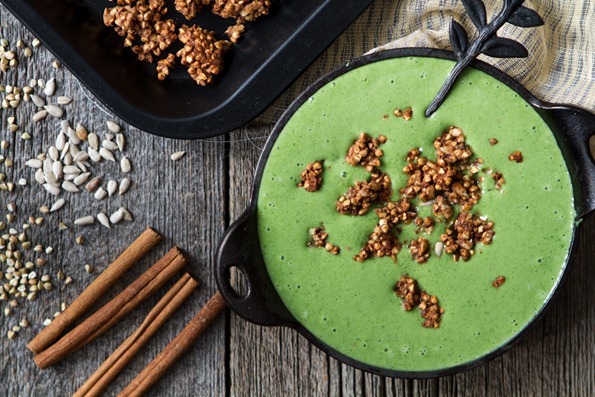 I haven’t had a green monster all winter (I know, I’m crazy), but seeing this recipe makes me want to have one to top with the delicious granola. Granola is so tempting! Yet another reason why I MUST try your homemade almond milk recipe! This granola looks awesome, especially on top of a green monster. Love that they’re oil free, too! This sounds out of this world!! This sounds incredible! I was just trying to think of more uses for buckwheat groats… now I know. I always have a hard time getting granola to clump, too, but maybe it’s because I use too much maple syrup… will try it with brown rice syrup next time. Thanks! what a delightful looking granola!! so great to see an alternative to oats, and such a great use of almond pulp! everything I have tried so far to use up pulp have been terrible, and not worth the time. I love that the pulp is not the ‘main ingredient’. Love the use of coconut syrup and sugar as well, I’m trying to keep low-glycemic so it’s perfect… can’t wait to make and devour this! I really need to make homemade granola. Nope, never have but I know right where to come when I do because you have several I’ve been itching to try! This looks like a fantastic idea! It’ll be a great way to use up the buckwheat groats I have, no soaking required! I have been wanting to play around more with buckwheat for ages, so thanks for this recipe! I am so excited to try this. However, I have nut allergies, and find it impossible thus far to find sunflower butter or sunflower seeds (that are not INSANE expensive) that do not carry allergy warnings. Any suggestions? I have no idea what Whole Foods carries…I am in Calgary and we don’t have that, but plenty of other whole food stores. The brand I buy is Sunbutter and it’s found in a lot of every day grocery stores around me (like Superstore/Loblaw) It says it’s produced in a peanut and tree nut free facility. I can’t recall the price, but it tends to be around the same range as other nut butters. maybe you can find a deal online for cheap? can’t you make your own – blend in a good blender and add a little oil as needed? I’ve had a bag of buckwheat in my cupboard for what seems like forever, now I know what to use it for! I’ve been making my own granola lately and this will be a nice change of pace from the oats. Yumm!! I love granola and am going to start experimenting with making my own almond milk, so this is perfect! That green monster looks amazing. I’ve been hearing a lot about buckwheat recently. I think I’ll pick some up soon and try it out. Thanks for the great recipe! But where do you get your buckwheat groats? I live in the city as well, but haven’t seen them anywhere! Q: Do you know how dangerous it is to have freshly baked granola sitting on the counter during a long winter evening? A: Yes, I do, because I make a batch of granola (usually your Lightened Up Summer Granola) every week to take for lunch/snack at work, and I can’t keep my hands out of it while it’s cooling. Even after I put it in the jar! But this week, like Jess above, I made the cinnamon bun granola, which also has buckwheat groats, so now I have to buy more to try this! By the way, I made your cake balls last night and will dip them in the coating and decorate tonight. I made four cups of granola and it was gone SO fast. It’s deadly straight out of the oven and still amazing as a cold cereal. Yummmm you read my mind. I’ve been trying to think of new, portable, breakfast ideas I can bring to work. Ding ding ding ding – granola! I think I might try the Summer Granola though, because I have no idea where to find raw buckwheat groats! I keep hearing more and more about buckwheat. Clearly this isn’t only a cute character from The Little Rascals. I’m definitley going to have to try this with some yummy green goodness as well. That green color is just fueling my need for spring to arrive! Not only have I been making batches of granola like crazy, I have been dying to try a recipe using buckwheat groats. You’re satisfying both my recent obsessions in one blog post, thanks! Wow, granola and a green monster, I have got to try that! That looks delicious! I’ve never made my own granola, but this recipe inspires me to change that. I can easily go overboard with granola as well!! 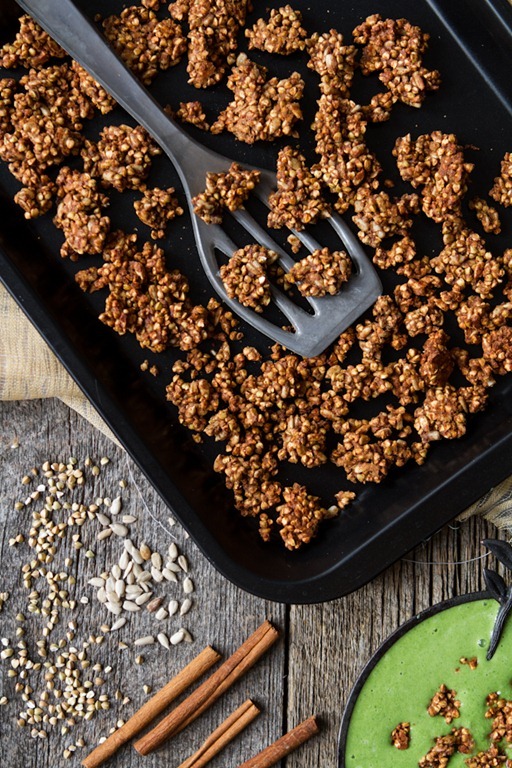 Never would have thought of using buckwheat – sounds good! Oh my goodness, I hear you on the dangerous granola thing. I made a batch this past weekend and have had to hide it up in one of my highest cupboards to stop myself from eating it all at once! These look delicious Ange! That green monster looks so appealing! What did you put in your delicious concoction this time? It was just a classic…frozen banana, homemade almond milk, kale! This looks so good & crunchy! Have you tried in the dehydrator or just as good in oven? I LOVE buckwheat granola!!! You’re the best Angela! My taste buds love you. Oh my, yes. I bake granola on a regular basis, and often find myself munching away at it while studying, and working through a batch too quickly. I try to either give it away or store it in a cupboard so out of sight, out of mind! Oh my! I could eat a whole batch of these clusters. Wonderful recipe! Yummy! Looks delicious, I can’t wait to try this. I don’t have much experience with coconut nectar so I’m looking froward to trying it. I love how you put your granola on your green monster – I’m a smoothie in a bowl gal myself and crunchies on top are awesome. I’m going to make this granola today with my daughter, we are needing to avoid oats right now (amongst other things) so I need fun ideas that she’ll eat. I’m thinking orange zest and goji berries to brighten up our gray rainy day :) Will let you all know how delicious it turns out! Because all your recipes we’ve made have been tasty so far Angela! I love your blog and I check it everyday! I have made many of your recipies and my husband loves them too! ^ Weird, I am not seeing a Milky Way Ad? I’m seeing Exquisite Antique Rings Of True Vintage Beauty or some such stuff? I would love to try this! Plus I love that you added it to a green monster!! My kinda of power snack! Hi Angela, I just wanted to thank you for your amazing recipes. I think you are a vegan genius. I wanted to tell you that I made your Triple Almond Cherry Crumble Squares this week and it was a HIT! I made a few adjustments: I substituted coconut flour for the rice flour, and I added more than 1/2 a cup of expeller pressed organic coconut oil to the crust base. Organic Coconut oil is supposed to be really good for you. These kept me and my vegan husband full for long periods – making a great breakfast. Thank you! Also, that recipe turned me on to grinding up raw almonds. I’ve made your vegan overnight oatmeal, but in place of bananas (which I find usually turn brown overnight!) I put ground up raw almonds. Also very sustaining! Anyway, thanks so much for all your amazing recipes! Good luck with the rash and take care! First off, I have enjoyed your blog for over a year now and love how you encourage others to live a healthy, balanced diet. With that balance in mind, I was curious what your perspective is on sustainability and local agriculture. Many recipes call for ingredients that aren’t grown in North America–such as coconut sugar in this recipe. Just curious how/if you incorporate local foods in your diet. This looks AMAZING! So excited to try this and even have all the ingredients on hand! I’ve been putting some almond pulp in our smoothies and so far no one has seemed to notice :) It is great to have another way to use it! Oh my goodness! I made this granola today and am totally identifying with your problem staying away from it. I subbed a little almond flour for the pulp and used pepitas, since they were what I had on hand. YUM! ah buckwheat…so good and so healthy! Angela, somehow you are able to make everything beautiful through your photography. I find your artwork truly inspiring. Next week I’m doing a post on food photography and I’ll make sure to send my readers over to you to check out what you can do with some food and a camera. I Love that you have added nutritional info. Yay! It’s the ONLY thing I think would improve your recipes. I love every single thing I have made from your blog. You are amazing! Yum looks delicious! Where do you purchase the raw buckwheat from? Oh and do you know of a good and cheap source to purchase oats (I live in Milton, ON)? Yummm! Angela! This sounds so good!! Could I make this with oats? I want my 3 year old to eat it and he may not try it if he does not recognize the buckwheat groats…and I could send it to his nut-free school! Hey Tracy, I’m sure it would work fine – just add the oats gradually to make sure it doesn’t dry out (I’m not sure how much you’d have to use) Let me know how it goes! So I made it with 1 1/4 cups of oats and threw in an 1/8 cup of raw quinoa because I had it and baked it for the same amount of time and it worked perfectly. And…I sent it to school today. Thanks for the recipe. This looks awesome! 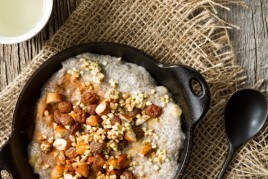 I love how you incorporated the buckwheat! These look amazing! What a perfect healthy breakfast option. I have a bag of unused buckwheat and now I know exactly what to do with it! Just made this and it’s great! First experience with buckwheat and I’m glad it came out so well. 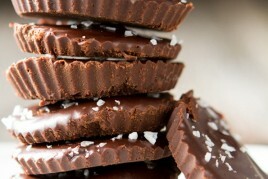 Used substitutions: regular cane sugar, brown rice syrup, almond butter, almond slivers. Delish! I know just what you mean about the temptation of fresh, fragrant granola! It’s even more tempting in the dehydrator because the smell is wafting through the whole house for a whole day. I usually put mine on a green smoothie as well. Nothing better! Good call on the sunflower seed butter – this was super yummy. Will need to make a second batch soon! Really original granola recipe! I tried it and it tastes great. I switched the almond meal with 1/4 cup of crushed almonds and it works perfectly. Plus, it’s gluten free! Thanks for this recipe. 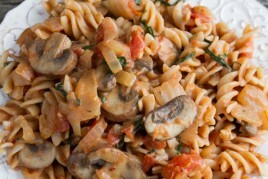 Did you know that this recipe is featured on thekitchn.com today??? First time cooking with buckwheat groats and this passed the taste test! Very unique flavors. Brought some to work and my co-workers loved it. This just came out of the oven and it is so so good! I can’t wait to top my smoothie with it tomorrow. Thanks for a FANTASTIC recipe! This was great! Made it the day you posted it. I used rapadura sugar (quarter cup) and a mix of yacon syrup and maple syrup and added linseed and vanilla instead of cinnamon. So goodesp since my tummy doesn’t like oat granola! This is really good! Made these using agave sirup and it worked fine. I also added a bit of cardamom to the mix and since I did not have enough buckwheat I added a bit of quinoa. It smells fantastic in the house! I substituted wheat germ for the almond pulp and it turned out great! I made these last Thursday. I actually made two batches, one with peanut butter the other with almond (I liked the almond butter one best). I made the mistake of taking in the peanut batch into work with me to share a new granola with my co-workers. There wasn’t a single crumb left. The bag traveled around my office so fast there was no amount of running I could do to keep up with it. Huge hit! Thanks for the recipe. This looks great but I have is toasted buckwheat…will that not work in this recipe? I am on my third batch of this granola, very good! I mixed it up a little with the ingredients I had on hand. First time I used raw buckwheat groats, but my local health food mart only carries kasha, so I’ve used that the past 2 times. I have to bake it for a lot less time or else it will burn. I also included oats the third time in addition, and it is great. Subs were peanut butter, honey (and some leftover corn syrup–gasp), coconut, almonds, and chopped brazil nuts. I have my first batch in the oven now. It smells so good. I know we’ll love it. I have a thought for the next time I make it—- I may mix the almond pulp in with the wet ingredients, to get it more evenly dispersed. What do you think? Yes – I made almond milk earlier in the evening. thanks for your wonderful recipes, discussion and photos, Angela! I’m a frequent visitor. I just wanted to leave a note and let you know how OUTSTANDING this recipe is/has been – I believe I’m on my tenth time of making it and without fail it’s always better than I seem to remember!! I have been following your blog for some time and have produced a multiple of your recipes (they have also all been made multiple times), and I must echo the sentiments of many who have commented above me that you are a genius. Thank you for consistently sharing innovative, tasty, and swoon worthy recipes. You are an inspiration to many of us and I cannot wait to continue to follow your journey. I just gave your granola a try and it turnd out beautiful. Thank you for sharing the recipe and keep up the good work. Your blog is oh so lovely. Mmm…had to try this, and it DID work with maple syrup! I even had a go at turning it into quinoa granola! http://itcomesnaturallyblog.wordpress.com/2013/06/05/quinoa-granola Bliss! Hi Natasha, I use raw buckwheat groats because I like the taste better (kasha is toasted and has a strong flavour) – that being said Im not really sure how much of a difference it would make in this recipe given that it’s toasted anyway! Let me know if you try it out. I am vegan and take many recipes from your site. I live in Waterloo and uanble to find raw buckwheat. I find Kasha every where I go. Can you tell me which Canadian site sells this product so that i can buy it. This is amazing! I have pcos and gallstones so I’m trying to eat better. Your recipes make it so easy, keep up the great work! I wasn’t sure what to expect but I just made this recipe and it is sooooo delicious and addictive. I had to make substitutions as it was a spontaneous event and I didn’t want to go to the store but turned out great anyways. I used peanut butter, brown sugar and maple syrup as I had those in my cupboard. Also the first time I used buckwheat in a recipe! This granola texture reminds me of sesame seed bars you used to get on airplanes but way better! Thanks Angie for another great recipe! I almost never post comments after having made recipes and I try out a lot of different recipes. But, I made this last night and it was amazing! Seriously, what a great, fabulous snack!! Thanks for sharing. This is really good. I used almond butter, maple sugar and brown rice syrup. I wanted a more vanilla taste since I like french vanilla granola, but I don’t miss the strong vanilla taste (which is not as intense in my experience in homemade things) in this. These are currently baking up in my oven for a lovely Sunday breakfast, and my house smells like Cinna-bons. Drool. I cannot wait to plunge into a bowl of these with ice cold hemp milk. Thank you for yet another thoughtful, mouth-watering recipe. Also- I make my own almond milk every week and would love, love, love to see another almond pulp recipe without requiring a dehydrator. I currently have unbelievable stores of pulp sitting in my freezer. I’ve made this twice now and it’s delicious! Hola! I’ve been reading your website for a while now and finally got the bravery to go ahead and give you a shout out from Porter Tx! I’m really looking forward to making this but just need to stock up on ingredients. Just wondering if you can use coconut palm sugar?? Yes coconut palm sugar and hazelnut butter will work ok. But I would not sub the coconut nectar syrup for the palm sugar as it will throw off the dry/wet ratio. Hope this helps! Oh and also, would hazelnut butter be okay? These clusters are delightful! I cut the coconut sugar by half and replaced the apple sauce with mashed sweet potato. The scent that fills the kitchen is intoxicating. Cinnamon is my favorite spice, that’s probably why. Great way to use up the leftover pulp!! I have so much in my freezer! Instead of the coconut syrup etc how about mashed, ripe banana? Or more apple sauce might even work?